Pork tenderloin is a great cut for the grill. A small pork roast, this piece of meat it amazingly tender if cooked right: that method is a hot sear over direct heat, then a slow finish over indirect heat. This process is going to give you a tender, juicy tenderloin with a crusty, wonderful surface. To accomplish this, you are going to need good timing and an excellent meat thermometer. Pork tenderloin should be cooked to an internal of 145 F/65 C.
The secret to great pork tenderloin is the combination of a direct and indirect fire so prepare your grill accordingly, and make sure that the direct grilling section is very hot. With the grill (or broiler(so that the meat will be about 4 to 5 inches from the heat)) prepared and the pork tenderloin seasoned, place it on the direct cooking surface, turning so that all sides are exposed to the heat during the direct grilling time indicated on the chart. After that, move the tenderloin to the indirect space (or switch your oven from broil to bake at 350 F/175 C). Continue cooking for the indirect cooking time listed above. As the cooking time starts getting close to being done begin testing the pork tenderloin with a good meat thermometer. To properly test the temperature on a pork tenderloin, insert the probe into the end of the thicker part of the meat, inserting it about two inches/4 cm. This will be the coolest part of the meat. Look for a temperature around 135 degrees F/60 degrees C. When the meat reaches this temperature remove it and place on a warm plate. Cover the tenderloin with a piece of aluminum foil and allow to rest for about 7 to 10 minutes. This will allow the juices and heat to evenly distribute. Once this phase is done you can carve and serve. 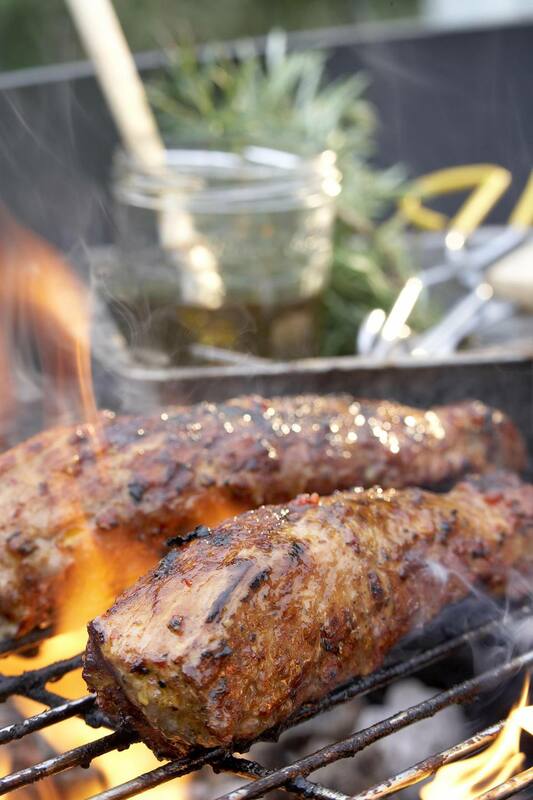 Once you have the basics down, try my best recipes for grilled pork tenderloin.